In a concerted effort to save money on its electricity bills, Grayslake Community Consolidated School District 46 has undertaken a $7.3 million project that will place a solar panel array at four of its school buildings, and eventually extend to all seven educational facilities in their holdings. Solar panels have already been installed at Prairieview and Frederick schools, along with the Park School Campus in Round Lake. Prairieview went online Sept. 8, with district operations personnel and representatives from Commonwealth Edison overseeing the hook-up, metering, and monitoring of the electric flow to the area’s power grid. The exact wattage generated by the solar field is still being calculated and study results will be available shortly. The solar panel field was placed behind the school building, facing south. Conversations about the potential of solar panel installations as a cost-efficient alternative to mounting electricity expenses began in 2016, with on-and-off discussions at the facilities and board levels. Acquiring factual information on the program’s viability proved to be the most time-consuming part element of the district’s investigations. Frederick School, located at 595 Frederick Road, broke ground for its installation June 27, followed by Prairieview School at 103 Belvidere Road in Hainesville, July 14. 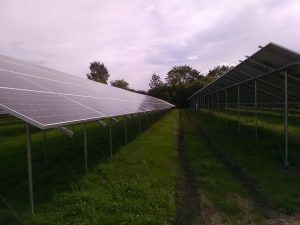 Both sites were ground array constructions for the rows of solar panels. The Park School Campus at 400 West Townline Road in Round Lake also started construction July 14, although the installation was a roof-mounted array. The next project site is the middle school at 400 Barron boulevard in Grayslake. The educational components for students to monitor the progress of the solar panel arrays in generating power also potentially supply lesson plans to meet state curriculum standards pertaining to science, mathematics, and other applicable sections.